I have been posting photo a day on my Instagram starting from 2016. This time, I thought of posting it on Facebook too. I just share it on Facebook through Instagram. It’s been a long time since I’ve posted anything on my Facebook. And this is how I’m starting. When I post on Facebook after a long period of time, many users don’t get to view my work. It’s because of the Facebook algorithm. If many people like it within a short period of time, then there’s a chance that my work will be showcased to other users. 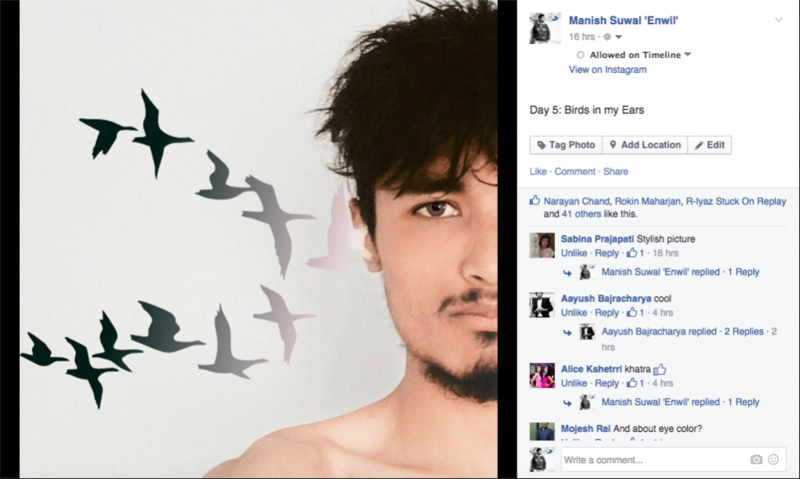 I received some likes on the first day, a bit more on the second and it’s been increasing since the third day. The photo I posted yesterday received more than 40 likes until now. 40 likes is nothing, but for me during this time, it’s a lot. I really don’t share my work with many people. I just share it among small group of friends. I run many Facebook pages, and they all have thousands of followers. Hundreds of likes is pretty normal. And I’m numb to it. I really don’t care. But when I received likes on my personal account, I started feeling happy. Like I want to work on it more, and produce more work so that more people can view it. However, being motivated solely based on Facebook likes is a dangerous thing. First of all, you’ll start to get numbed down by the likes. The reason I’m happy that people like my work is because I haven’t used Facebook for a long time. Even one like means a lot to me. But if I keep using it like before, I’ll get numbed down by it. Hundreds of likes won’t even matter, and my main source of inspiration and motivation will suffer. While moving on, a photo you posted on January 6 might receive more likes than the photo you post on January 18. So, you’ll feel like your work is degrading because more people didn’t like your post. The best thing to do would be post photos irregardless of the likes. Here’s the link to the Instagram Album from my Faceboook account. And here’s the Album on my Facebook Page.